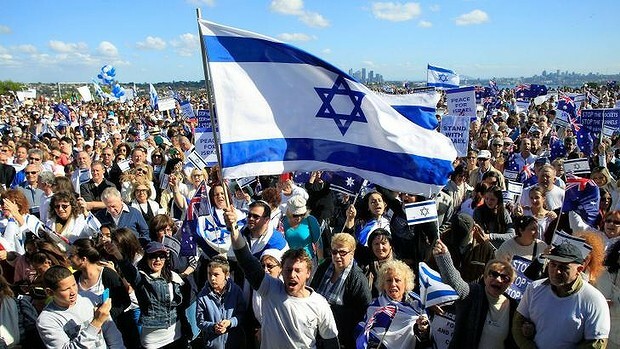 SYDNEY – Ten thousand Australians rallied in support of Israel in Sydney on Sunday at a peaceful demonstration in one of the city’s suburbs. Participants at the rally waved signs saying “We stand with Israel!” and “Stop the rockets!” and chanted “Am Yisroel Chai” as they heard communal figures defend the Jewish State. The president of the Executive Council of Australian Jewry (ECAJ), Robert Goot, a World Jewish Congress Vice-President, spoke about the rise in anti-Semitic attacks since the beginning of Israel’s Gaza incursion. Friends, once again - We stand proudly with Israel. We stand with Israel for its security and above all for peace. We stand with Israel in mourning the deaths of 64 brave members of the IDF. We deplore the appalling loss of life and injury sustained by innocent civilians in Gaza and in Israel. We know that Israel has taken unprecedented steps to minimize civilian casualties, and we know that those efforts will be intensified, whilst Israel exercises its fundamental right, which we support, to protect its citizens from armed aggression. But we have to recall who it is firing the rockets and tunneling into Israel – not just “militants” as 60 Minutes chose to describe them last week, but Hamas – an organization that is openly violent, genocidal and anti-Semitic and is proscribed as a terrorist organization including by Australia. And let us not forget that the Hamas Charter explicitly calls for the elimination of Israel by force and the removal by extermination or expulsion, of its Jewish citizens. That is why the rockets are fired and the tunnels are built. It is not a blame game it is the shocking reality. Israel understands it – so should the world. It is those facts – largely ignored by the media, which are fundamental to understanding the position Israel is in; the existential threat to its existence; its response and whether or not it is proportional. From January to 30 June 2014, Hamas fired more than 200 rockets into Israel. The only purpose was to kill or maim innocent Israeli citizens. No one complained; the UNHRC said nothing; there were no demonstrations about Hamas’ war crimes – for war crimes they were and are. From July 2014, Hamas bombarded Israel’s major population centres with thousands of rockets. They are not fire crackers. They are not unsophisticated rockets which Israel can ignore. And if they are only “backyard rockets”, it is only because Hamas’ backyard is Iran. That the rockets have not resulted in more deaths, is solely due to Iron Dome’s effectiveness. But the disruption and the psychological and related effects alone on the young, the old, the survivors of the Shoah and other sections of society, is well documented, massive and completely unacceptable and intolerable. And then there are the tunnels, constructed with materials provided to Hamas, including by Israel, to build houses, hospitals and schools, but cruelly and cynically diverted for the explicit purpose – not of safeguarding or advancing the interests of Gazan civilians, but of delivering Hamas terrorists underground into Israel to do their worst. These are sophisticated tunnels, 4-5 stories below the ground, constructed in a vast network, from hundreds of thousands of tonnes of cement, diverted from civilian infrastructure. And whilst Israel is condemned for killing innocent children, not one word is uttered by its critics, lamenting the death of 160 Palestinian children who have died helping to build those tunnels. We deplore the loss of innocent lives, but we know that Hamas’ cynicism, in locating its armaments in, and operating out of, homes and mosques using human shields, knows no bounds. Who other than Hamas, would locate its command centre underneath the al-Shifa hospital? And fuelled by the unavoidable outcome of Hamas’ deliberate policy, Israel’s defence of its citizens has unleashed an outpouring of hatred of Israel hatred and open Jew hatred, the likes of which have not been seen in Europe, since the early 1930s. But what would the world have Israel do? Not respond; attack the weapons but not the tunnels or vice versa; or simply turn Iron Dome off for a day or two. We know the answer - Israel like any other responsible nation, must defend its citizens whilst taking care of innocents in harm’s way. No one else would put up with it and nor should Israel. And what has been the reaction in Australia? Last week, 43 parliamentarians called for “a cease-fire, which includes an end to the Israeli occupation and the blockade of Gaza”. What occupation of Gaza you may well ask? Israel ceased to occupy Gaza 9 years ago. In 2005, it unilaterally withdrew all its citizens and troops, but left its agricultural infrastructure, in the hope that by ceasing that occupation it would find some peace. After Hamas took control in 2007, all Israel got in exchange were rockets. It was only then that the blockade was imposed. And how can there be a call to end the blockade, without at the same time calling for Hamas’ weapons stockpile and the vast network of deep tunnels extending under Israel’s border, to be destroyed. Were it otherwise, a ceasefire would mean that Israel would cease, but Hamas would have an unrivalled capacity to fire. Then they say that Israel’s response has been disproportionate. As if the concept of proportionality in war is based on the number of each side’s civilian casualties. It is not and never has been. The rule of proportionality in armed conflict relates to loss of civilian life, injury to civilians, damage to civilian objects which would be excessive in relation to the concrete and direct military advantage anticipated”. The “concrete and direct military advantage”of Israel’s military actions in Gaza is the removal of the direct threat posed to the lives and well-being of 8 million Israeli citizens (Jewish and Arab) by Hamas rocket attacks, which by being “indiscriminate attacks” that are “not directed at a specific military target”, breach the Geneva Convention. Further, the discovery of a vast network of tunnels from Gaza under residential areas in Israel, arguably poses an even greater threat to Israeli civilians than rocket fire directed at Israel’s civilian population centres. Under the Geneva Conventions, Israel must give civilians warning of attacks and try to keep civilian casualties to a minimum, which is precisely what Israel does. Israel forewarns civilians via leaflets, text messages, phone calls and other means of the time and place of impending operations (even if this means prejudicing their military effectiveness) and provides maps showing civilians where to go to be safe. Of course Israel like every country makes mistakes, but Israel’s mistakes are neither accepted as such, nor forgiven. And what about the mainstream media in Australia, who have failed to guard against biased, distorted, inaccurate and simply erroneous coverage and commentary. The cartoon in last Saturday’s SMH was unquestionably anti-Semitic. Our letter of complaint to Fairfax was not even published. The Carlton accompanying opinion piece, was simply a disgrace and had no place in a once highly respected newspaper. The report in yesterday’s SMH blaming Israel for breaking the ceasefire was untrue and contradicted by the UN and others. 60 Minutes “Unholy War” last Sunday night, did a massive disservice to accurate and balanced reporting including by completely failing to give its viewers an understanding of the issues and the reasons for so much loss and destruction. Hamas was hardly mentioned – it was all about “Palestinian militants” who were “funneling years of Palestinian frustration”. Viewers were told that Israel was “trying to get rid of as many Palestinians as they can”. And there was no attempt to have anyone counter that libel. And in another untruth, viewers were told, complete with graphics, that “Israel was carved out of the Palestinian territories of the West Bank and Gaza.” The 1947 UN partition vote, the 1948 war of independence and the 6 day war, might never have happened for viewers of 60 Minutes. Friends, if we control the media as is sometimes hatefully alleged, we’re not doing it at all well. Not everyone who criticizes Israel is anti-Semitic, and whilst many people of goodwill are truly shocked and dismayed at the loss and suffering, the most concerning aspect of what we have seen and heard in the last few weeks is that, fed by the distorted media reporting, some of the anti-Israel brigade both on the left and the right, are now showing their true anti-Semitic colours, or as Melanie Phillips observed “the mask has been torn away”. And perhaps even more troubling, in Australia, there has been a dearth of condemnation of this outbreak of anti-Semitism from civil society. There is much work to be done and rest assured we will do it with your help. Keep writing letters get the facts from us and keep them polite factual and firm. Friends, in our lifetime we have been truly and uniquely blessed to witness the miracle of the rebirth of the State of Israel. After 2 millenia of yearning, Israel is here - and here to stay. On the eve of Tisha B’av, when we mourn the destruction of the 1st and 2nd temples in Jerusalem, we stand with Israel knowing that there will be never be the destruction of a 3rd temple in Jerusalem – never. Today, we stand with Israel in its quest for security. We stand with Israel in its search for a true, just and lasting peace with its Palestinian neighbours – 2 states for 2 peoples. Today, as always we stand with Israel proudly together – Am Yisrael Chai.